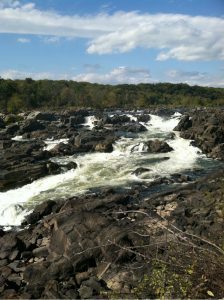 At Great Falls, the Potomac River drops 76 feet in less than a mile through a gorge that narrows from 1,000 feet wide to less than 100 feet through Mather Gorge. It is one of the steepest and most dramatic rapids of any eastern river. No wonder then that Washingtonians made the trip to Great Falls even before the C&O Canal was built. While many trails, overlooks, locks, Canal boat rides, and the Washington Aqueduct provide plenty to see and do at Great Falls, the centerpiece is the Great Falls Tavern. Originally a lockkeeper’s house built in 1829, it was enlarged and transformed into a popular hotel called the Crommelin House. The hotel was a favorite of Congressmen and other high officials in Washington. Not so much for the canal boat community, who complained the tourists interfered with their journey through the locks. The flood of 1889 spelled disaster for both the Canal and the hotel, as many of the Canal structures were either damaged or destroyed. Water reached the second floor of the hotel. Both continued to do business, but never reached the same level of prosperity as in the mid 1800s. Today the Tavern serves as the National Park Visitor Center with interpretive displays and a book shop. It’s open daily from 10 a.m. to 4 p.m. in season.